The Uwe Boll Turkey Day Extravaganza! Uwe Boll: Good to Bad, Bad to Worse, and Worse to Terrible! A young student stands to inherent a fortune provided he can pass his first semester of college and find a steady girlfriend. His scheming stepfather has other plans for the money, however. A handsome, brilliant stock trader, bored with his existence, becomes a serial killer. A heated game of poker causes three men incarcerated for nonviolent offenses to brutalize their cellmate before taking drastic measures in order to cover up their crime. A conspiracy-theorizing filmmaker meets with a prospective producer in order to pitch a movie about the death of real-life German politician Uwe Barschel, in which the official ruling of suicide raised more questions than answers. On the last day of school, two bullied teenagers decide to take revenge on their tormentors. From a terrible director comes a terrible movie. After a seemingly undead man is bound and buried alive, he digs himself back to the surface and seeks bloody vengeance on those who caused him his suffering. Smart-ish straight to video thriller fodder. A while back I read an interview with Uwe Boll saying how his early non-video-game-adaptation movies are better and people should watch them as well before judging him. I've done both, and I have to say Uwe Boll makes no bad calls any other straight-to-video filmmaker wouldn't either, he's just much more high-profile thanks to his video-game franchise licenses. He isn't a bad director, but he's not one of the best either. Blackwoods is a case in point. It's an entertaining, solid movie, but it has problems, namely confusing writing and an end that comes suddenly and explains everything in five minutes flat. 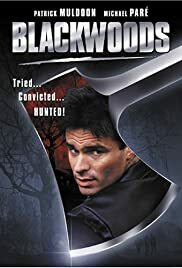 Blackwoods constantly refers via flashback to a horrible car crash that the main character has before the start of the movie, where a woman is accidentally killed. It constantly drops hints that 'sumthin' ain't right' with the main guy Matt, but doesn't really have any exposition till the closing minutes. While this keeps the pace brisk, it does mean that you feel a little left out of proceedings. Also, the cast lay their 'you ain't from around here is ya boy' routine on a little thick. If Clint Howard had acted any stranger I would have started to expect Jeremy Beadle to hop out from behind a TV set during the motel segment. Given that Boll actually does a good job of developing an uneasy atmosphere for the movie, it seems unfortunate that he also got his actors to really turn up the 'weird dudes' knob. It kind of cheapens the effective direction a little. Still, despite it being quite confusing at times, and having some fairly odd, unnecessarily nuanced acting (not bad, just really strange), Blackwoods is an entertaining film. The storyline is intriguing, and the way it's fed to you is quite gripping. Unlike Boll's House of the Dead, his other film I've seen, which is non-stop stupidity (though I hasten to add, that's good stupid not bad stupid), Blackwoods is quite intelligent and well put together. It's worth a shot, don't expect a miracle, but give it a try, you could enjoy it a lot.